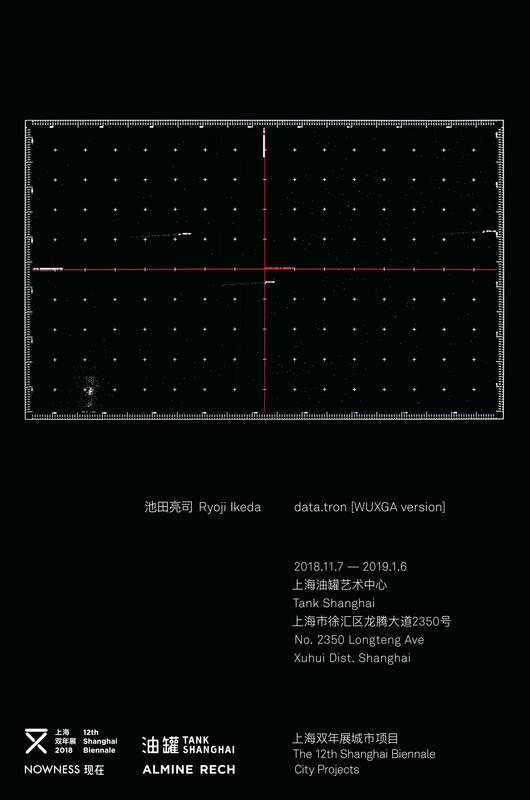 Tank Shanghai is pleased to announce the solo exhibition data.tron [WUXGA version] of Ryoji Ikeda (Born in 1966 in Gifu, Japan) between November 7, 2018 and January 6, 2019, a city project of the 12th Shanghai Biennale. data.tron is part of the datamatics project, a series of experiments that explore such questions both physically and mathematically. Visitors will experience the vast universe of data in the infinite between 0 and 1.data.tron is an audiovisual installation in which each single pixel of visual image is strictly calculated by mathematical principle, composed from a combination of pure mathematics and the vast sea of data present in the world. These images are projected onto a large screen, heightening and intensifying the visitor’s perception and total immersion within the work. datamatics is an art project that explores the potential to perceive the invisible multi-substance of data that permeates our world. It is a series of experiments in various forms – audiovisual concerts, installations, publications and CD releases – that seek to materialise pure data. Special thanks to NOWNESS for its generous support and Almine Rech Gallery (Paris, Brussels, London, New York), who has accompanied and supported the project since its inception.